Why have outdoor kitchens become so popular? Have you noticed how people always gather in the kitchen of your home? Whether its family time, a casual gathering of friends, or a big party - you can count on folks to gather in the kitchen. Now imagine that kitchen as big as your backyard. Outdoor kitchens (also called summer kitchens) allow the gathering to go outside without losing that homey kitchen atmosphere. Take the oven, the sink, the cooktop, the refrigerator, the cabinets...take it all - outside. No more running in and out from the grill to the fridge. No more lugging a cooler out and back in. Everything can now be outside. The great outdoors with all the convenience of a modern kitchen. Another great benefit of adding an outdoor kitchen is the return on your investment. The National Association of Home Builders estimates that you may recoup as much as 130% of your cost to build! That means that eventually, you'll get paid to add fun and enjoyment to your home and your life! Outdoor kitchens are more than just a big grill. Of course, the grill is a necessity, but that's just the start. Cabinets, warming drawers, tables, bars, wood fired ovens...the list goes on. From basic to exotic, the choices are limited only by your imagination. And of course, your bank account! There are lots things to consider as you plan your kitchen. This is a significant step in an overall backyard design. Be sure you will use it enough to justify the expense. After all, the old fashioned way of cooking on a portable grill and walking back inside the house for your needs still works. But if you're ready to take your backyard design to the next level, an outdoor kitchen may be the perfect choice for you. The options on grills are numerous, and the price tags reflect them - but do you need them? If there are only two of you, and nobody ever comes to visit (that is likely to change once you add an outdoor kitchen) do you need a huge grill? If you are going to primarily cook burgers, steaks, and pork chops - do you need the expensive rotisserie? Would a pizza oven be better suited to your needs? You can get all of these, but there's no need to spend the money if you aren't going to use them. Now, having said that - don't get cheap with the grill. Pick the features you will need, and spend some money on the grill. This is, after all, the part that makes all the rest worth having. The last thing you want is to install a cheap built-in grill in a beautiful stone veneer with custom granite countertops only to have to take it out repair or replace it. So buy quality here. If you can not afford a quality built-in, consider a portable cart style grill. After you take the steaks and chops off of your big beautiful grill and pass them out to your highly impressed guests, do they have a place to sit? Are there covered seating areas for light rain, or for relief from the sweltering sun? Be careful to keep the seating a reasonable distance from the grill. You want to cook the T-Bone, not Uncle Joe. The effect of great outdoor cooking is lost if everyone goes back inside to eat. The rest of your outdoor living area should support and complement the kitchen. That doesn't mean you have to spend money on a covered porch or a gazebo (although both are nice) but you should at least have a patio umbrella over a table and chair set. Okay, all of these topics are important, but the way you position your kitchen often gets forgotten. Then, after you've spent the money and time, you realize you will be staring into the setting sun as you eat. Many outdoor meals are eaten around sunset. Remember that when you position your backyard kitchen components. If the sun sets on the other side of your house, then you don't need to worry about it. Also, remember that the sun can be brutal as it reflects of of shiny stainless steel, so be aware as you decide where to put those items as well. If the afternoon sun is an issue for you, you may want to consider a darker, less reflective surface for your countertop. Realize that regardless of how elaborate your outdoor kitchen is, it will always be tied to your indoor kitchen to some degree. You will be less dependent on the main kitchen, but you will not be completely disconnected to it. Keep that in mind as you lay out your backyard kitchen design. You will appreciate a shorter, unobstructed path as you make trips back and forth. The planning stage is the time to decide which direction your various kitchen components will need to face. A little time and thought now will save a ton of headache later. Cooking and eating may be the highlight of the outdoor time, but they're not the only things happening. Do your guests gather to watch the big game? If so, consider an outdoor television. Otherwise you may be the only one outside, doing the work while everybody else enjoys the Carolina Panthers beating whomever they happen to be playing. (Okay, I'm biased. So sue me.) Do your friends and family tend to just hang out chatting while the meal is being prepared? Then you'll want some music playing through a nice outdoor sound system. An outdoor refrigerator sure beats running in and out of the house for cold drinks, or lugging a cooler full of ice around. 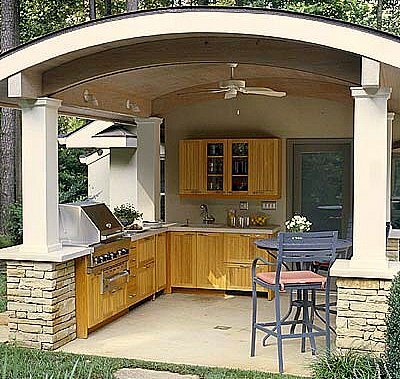 Will you be utilizing the outdoor kitchen in cooler weather? A built in fireplace or a portable firepit keep things cozy throughout most of the year. How much space do you have in your backyard? If you have a small courtyard behind your town home, you probably won't have room for a full, deluxe outdoor kitchen. If you put it in anyway, your guests will have to stand in your neighbors yard. An excellent option for many people is a BBQ Island. More than just a grill, but not quite a full blown custom kitchen. Available in a wide array of styles and prices, this can solve many common issues by combining several outdoor kitchen elements into a self contained unit. The idea is that you need to think about your needs, not just about what looks cool in the pictures. Buy what you need, within your budget. Speaking of budgeting - that is a real consideration. Outdoor kitchens can cost from $1000 to over $100,000 depending on the options, materials, size, and how exotic you may want to be. If your budget allows you to go hog wild - have at it! If not, do what you can, as you can. Everything does not have to be done at once. Just remember to think out your long term design plan as you go step by step. 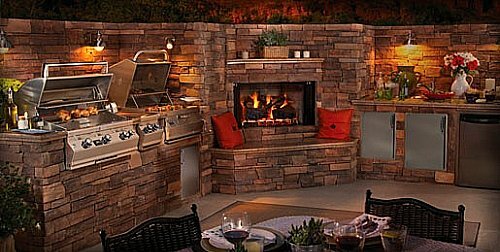 Keep in mind - while an outdoor kitchen is a great and fun addition to any backyard, it is not essential. The vast majority of backyards don't have one, and people have great times there anyway. If it fits your needs, your space, and your budget - go for it! If it doesn't fit those things, don't despair. Many, many great times and great memories have been made on a simple patio with a small charcoal grill. What matters most is spending quality time with family and friends, whatever the setting. But since you're outside anyway - you may as well make a great backyard while you're at it! Again, a great compromise might be a BBQ island rather than a full blown outdoor kitchen. These are essentially all in one units that come with a customizable array of options. You won't have to give up much since the can have all the bells and whistles and they look great as well. In my opinion, they give you the most bang for your buck and are well worth considering.